The gender gap in achievement in science continues to plague science educators in the United States (AAAS, 2001). Strategies to close this gap have defined the problem in terms of girls’ lack of interest or their inability to survive in science classrooms. Recent feminist scholarship has re-centered this problem of gender inequity not on girls, but on the nature of science and how it is taught in schools (Birke, 1986; Parker, 1997). Lesley Parker (1997) argues that it is schools that need to change and recommends a gender-inclusive science curriculum for schools. My dissertation argues for a new framework and research agenda for understanding the relationship between gender and science in schools. My study examines the gender dynamics of how unequal gender relations are negotiated, resisted and sustained in the context of a second grade science classroom. 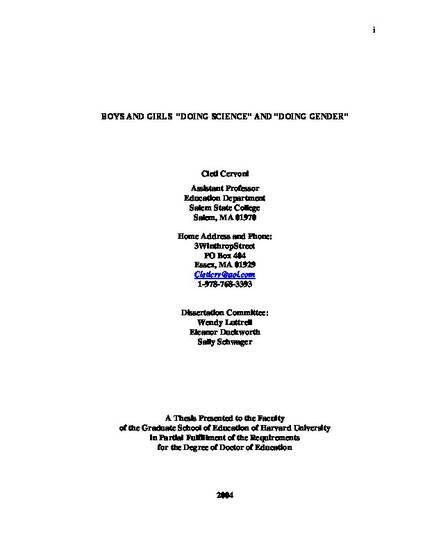 In examining both practice and discourse within the gender dynamics between the boys and the girls in a science classroom, I found that the boys positioned the girls as their assistants, as incompetent in science, as weak in contrast to the boys, and in need of the boys’ help and protection. These discourses functioned to create and sustain unequal gender relations in the classroom. The girls responded in paradoxical ways to the boys’ positioning of them. They resisted the boys by: a) ignoring them; b) using a domestic discourse to negotiate/gain more power; c) appropriating teacher authority; or d) using sexuality to embarrass and silence the boys. The girls also deferred to the boys as experts in science. In these ways, the girls themselves contributed to maintaining unequal gender relations in the classroom. I found that the classroom context is a site of struggle for both boys and girls as they seek to secure a place in the social hierarchy of the classroom. For the boys, masculinity is strong and powerful yet fragile and vulnerable. The girls struggle in holding multiple images of femininity. In this way, this classroom is a reflection of the struggle of masculinity and femininity in the larger American society and culture. Examining gender dynamics through positioning and negotiation for power in a science classroom has implications for teaching science in elementary school.